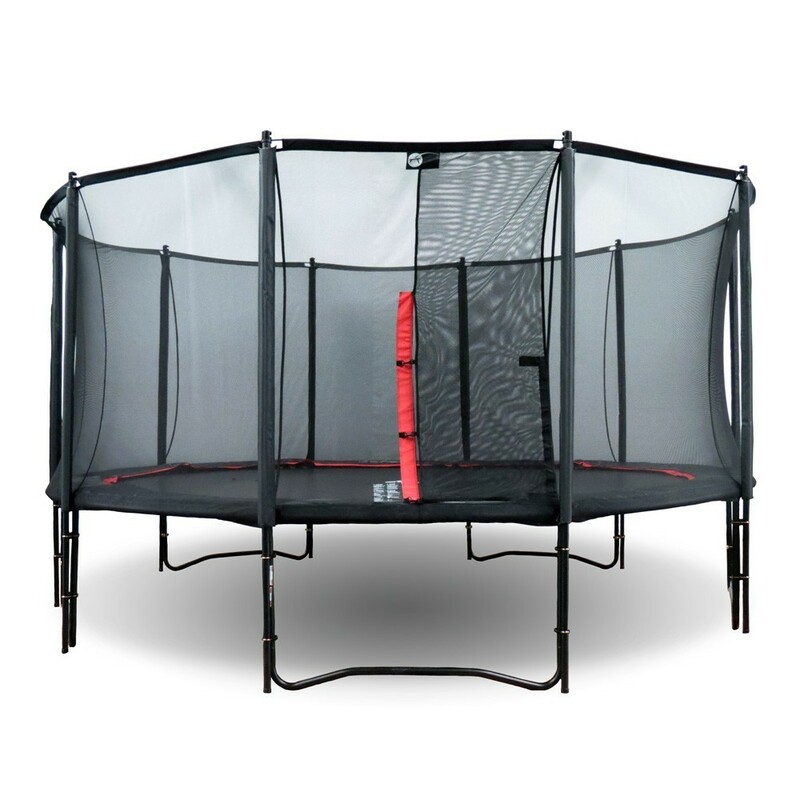 The biggest Booster trampoline will provide lots of space and fun for learning new tricks. Free standard delivery in continental France. Shipped within 24h if ordered before 11 am. 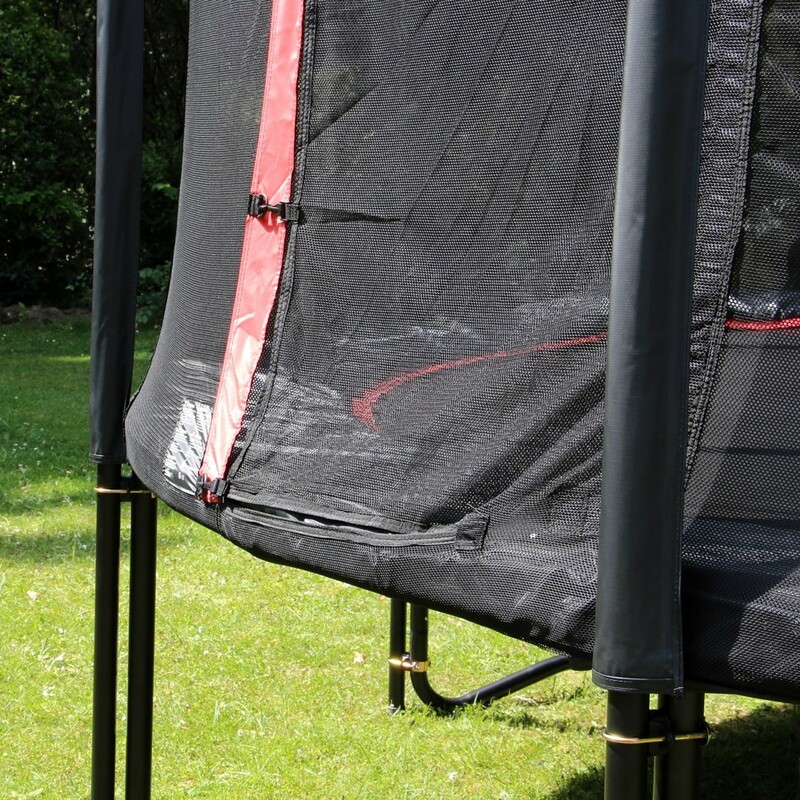 The frame, springs, and jumping mat of your trampoline have a 5-year warranty. The net and safety pad have a 1-year warranty. The other parts have a 6-month warranty. Questions? Please contact our support team. You may pay in 3 monthly installments for purchases of 150€ or more, and in 4 installments for purchases of 450€ or more. The first installment is due when placing your ordering, followed by monthly installments. These installments may be made by cheque or credit card. 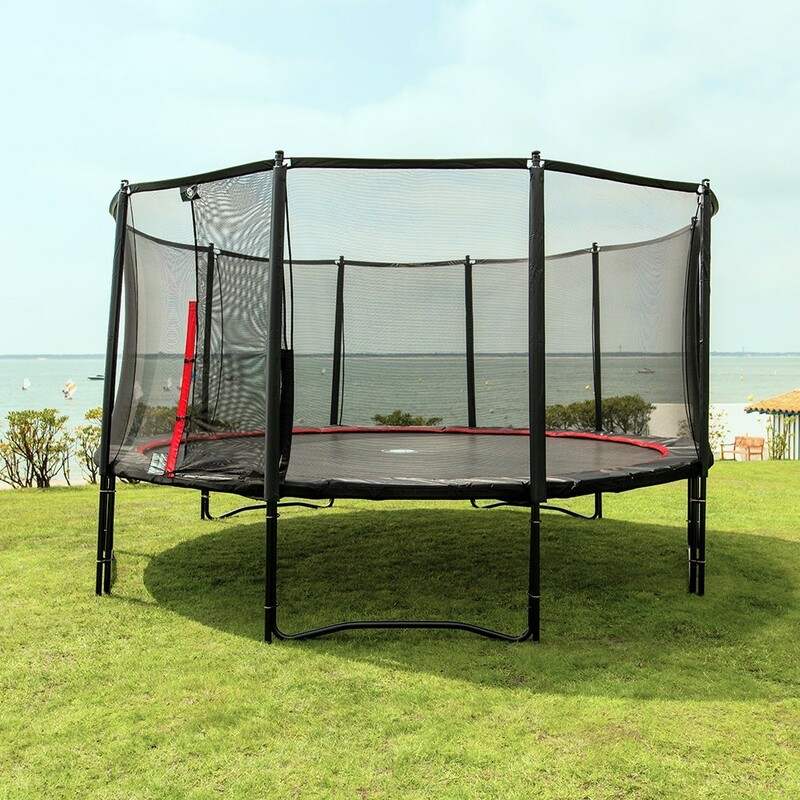 With its large 16ft diameter, this trampoline offers a generous jumping area for children and adults alike. With its distinguished look and its 120 springs, this Booster is reserved for dynamic jumping amateurs and high-performance equipment. 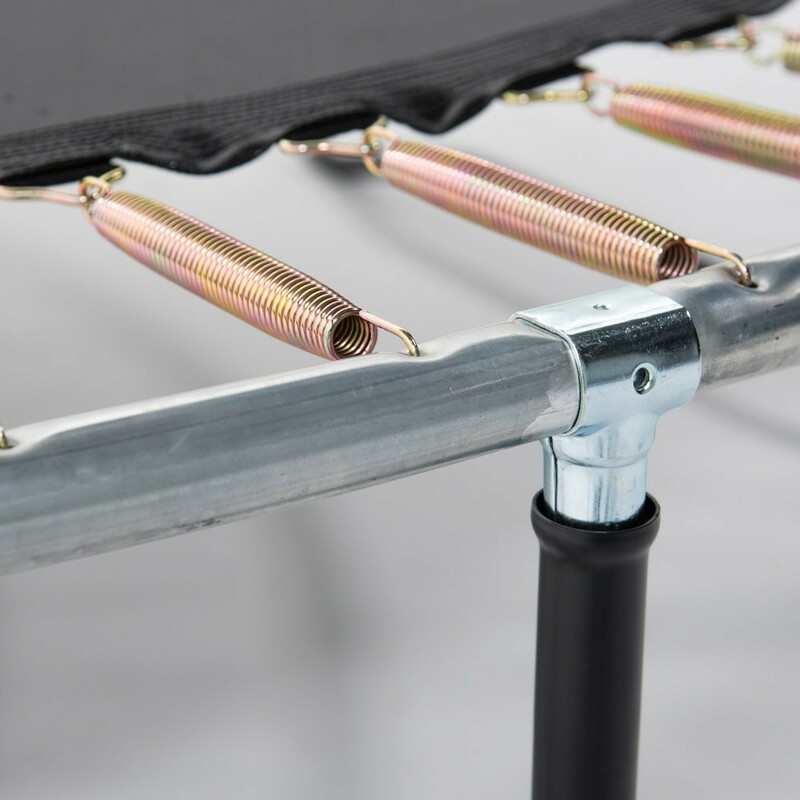 - The 120, 230 mm long springs that equip this trampoline will allow users to jump to new heights. 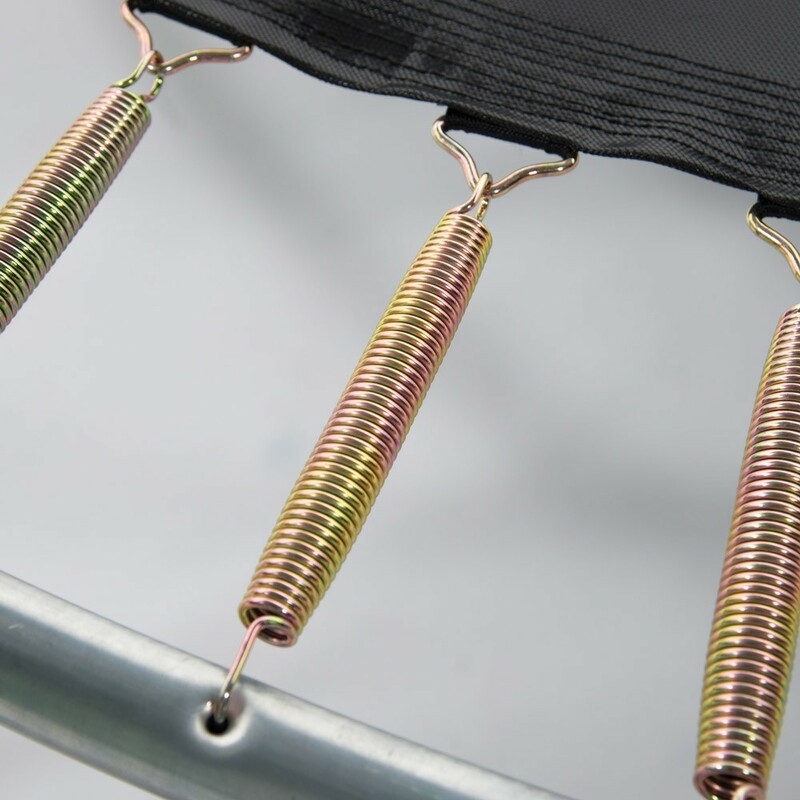 These longer and larger springs bring a better jumping quality compared to low cost trampoline with 14 or 16 cm long springs. 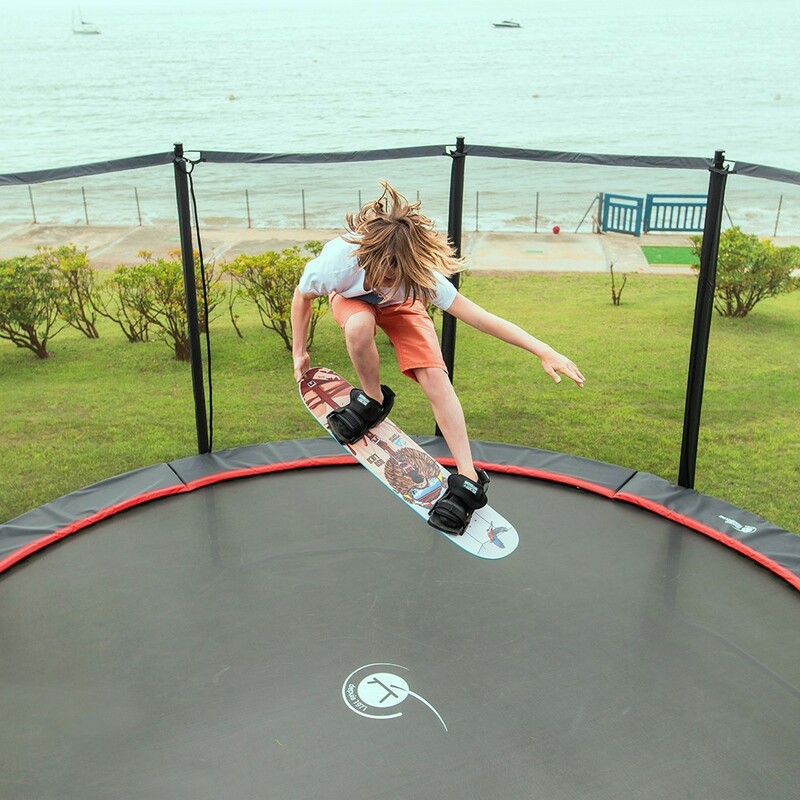 - 14,38 sqm dedicated to jumping, the equivalent of a large sized bedroom!This is the perfect amount of space to try out all of our accessories, from freestyle skis to basketball hoop. 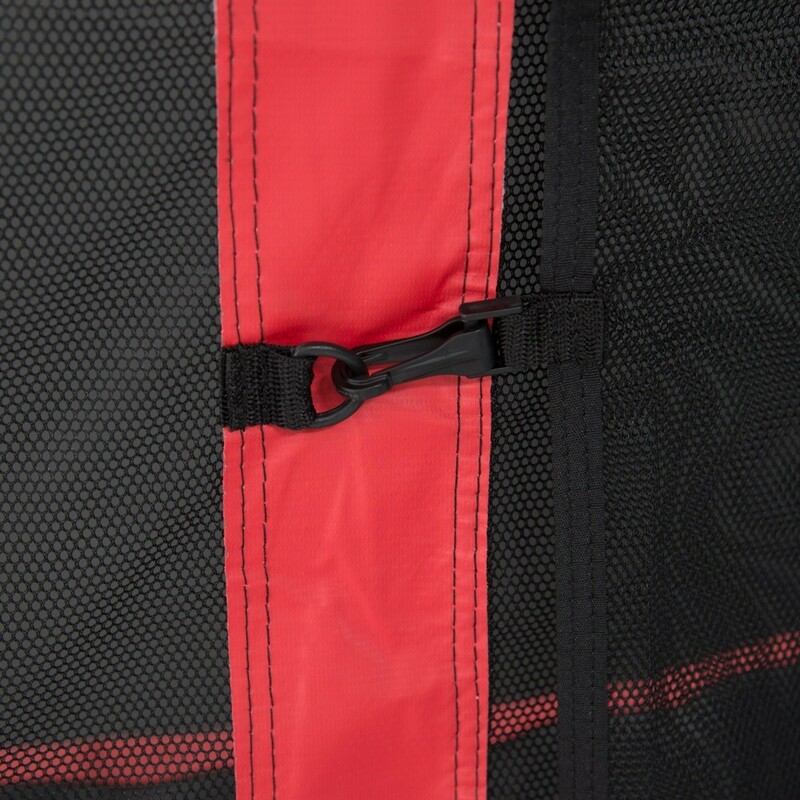 For extra resistance, the jumping mat is strengthened with a reinforcement strap and 8 rows of stitching. 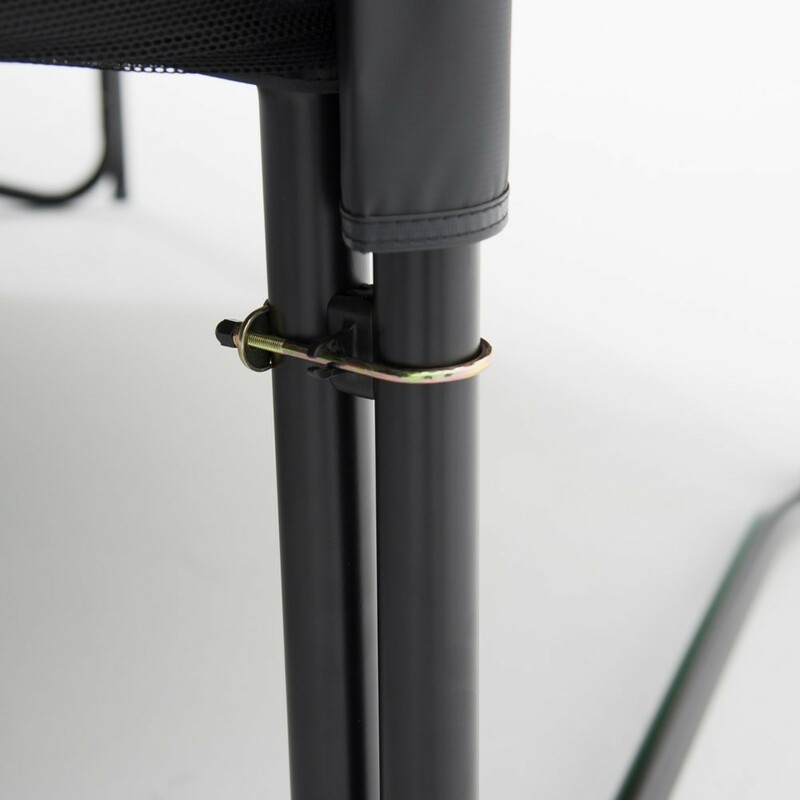 - Withstands up to 170 kg! 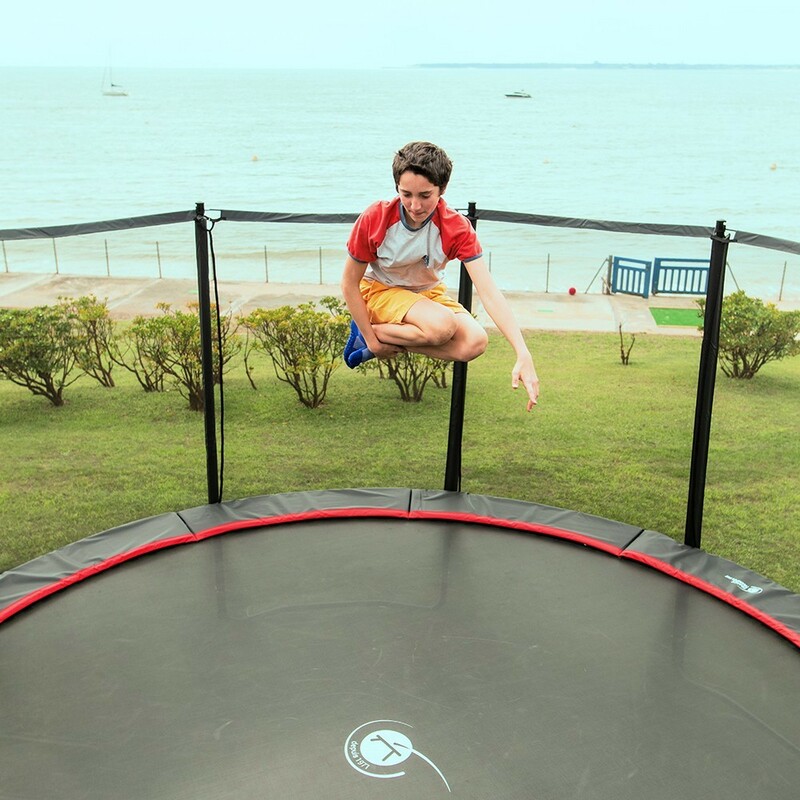 The framework of this trampoline is made from 2 mm thick and 48 mm wide galvanized steel tubes that fit together thanks to T-junctions components. - Safety and solidity guaranteed thanks to our premium enclosure. The 10 large net posts stand directly on the ground and render the entire structure more stable. These net posts measure 38 mm in diameter, compared to 25 mm found on most other brands. More so, the metal work is not pierced as we use brackets to fix the net posts. 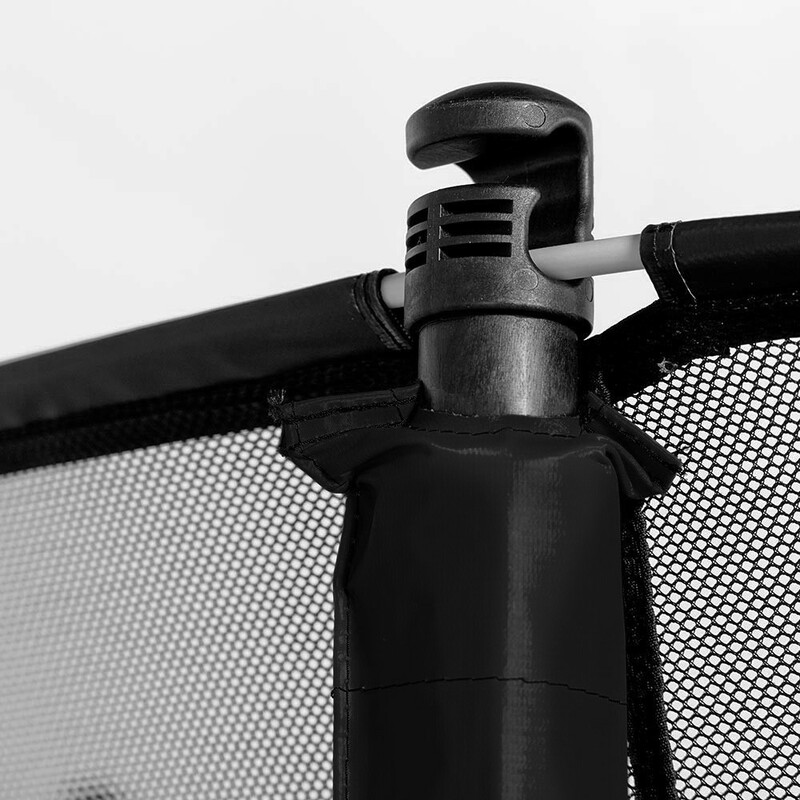 - Optimal netting tension thanks to fibreglass rods, for a more stability and aesthetics. 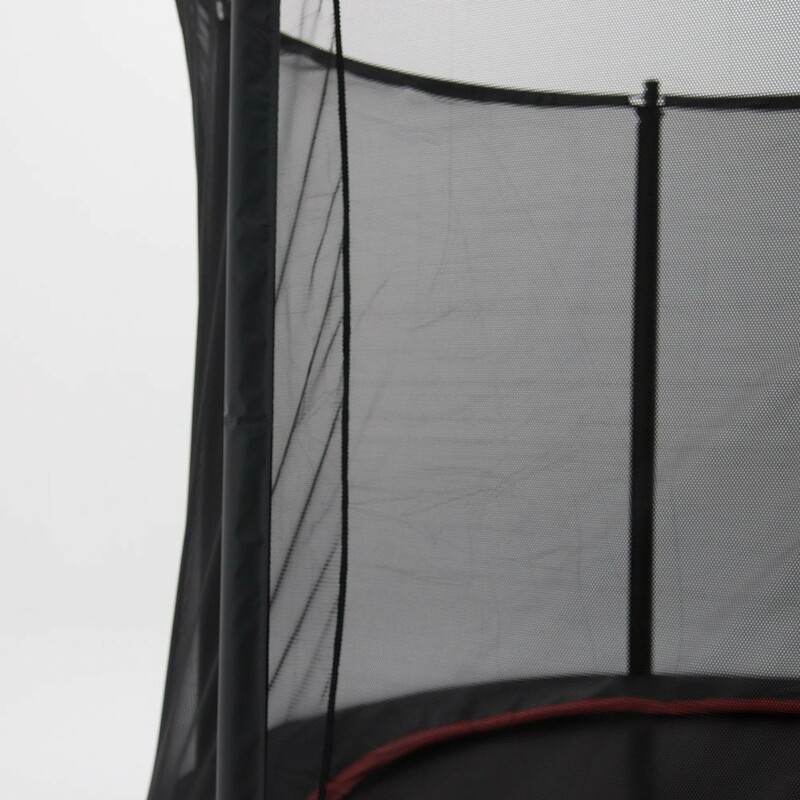 The net is made from tight polyester netting, softer and more resistant than polyethylene netting that is used on most trampolines on the market. - Thick frame pad that covers the whole spring area. 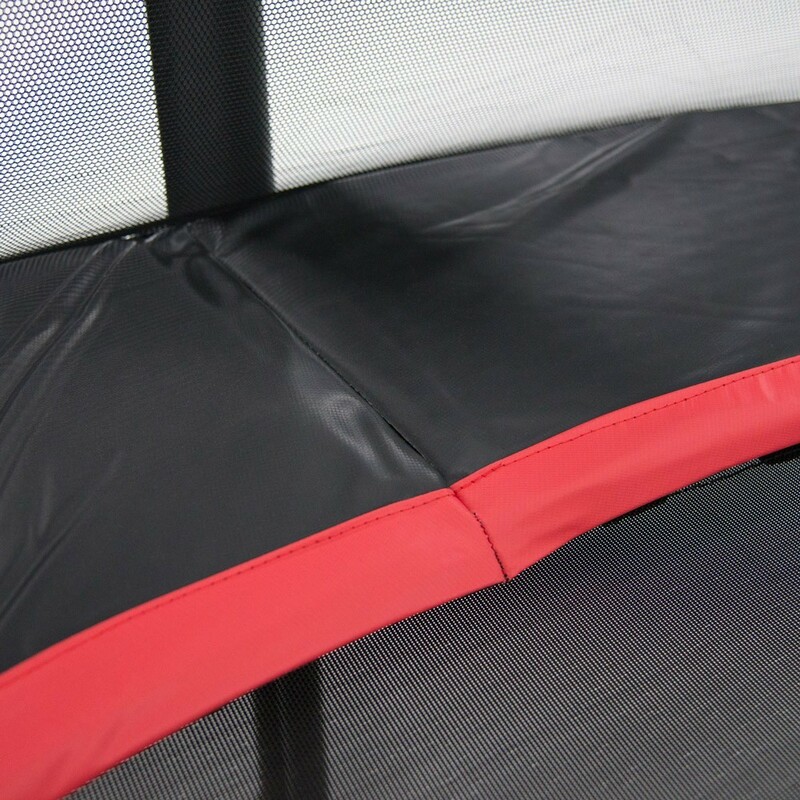 It ensures user safety and breaks any falls outside of the jumping mat area. The 650g/m² PVC cover is very resistant and has a UV protection. 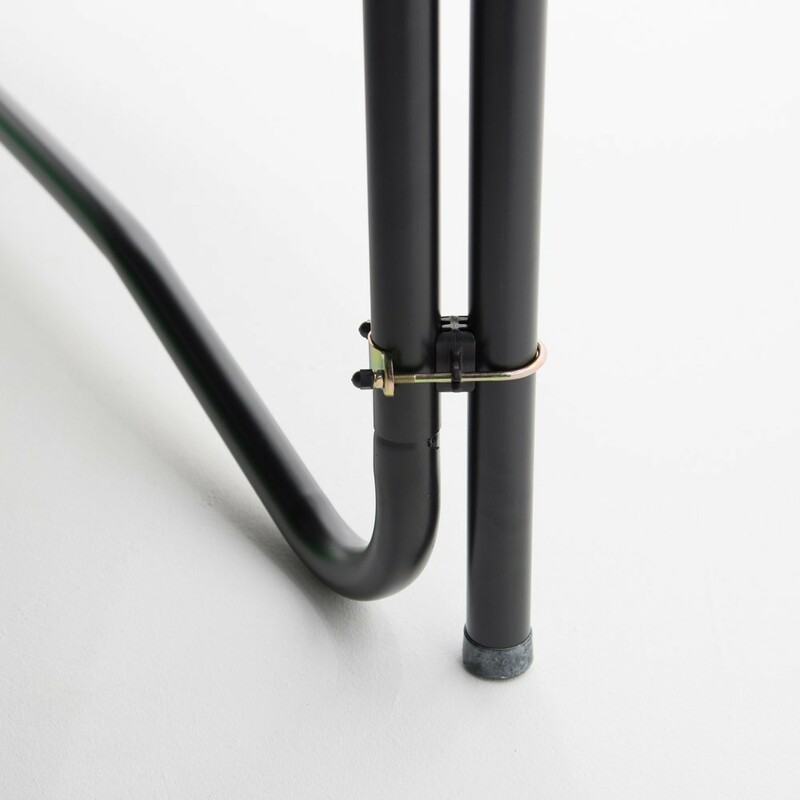 Thicker, galvanized steel, black laquer finish, large springs, the Booster stands out from the rest thanks to the quality of its materials and its bold design! 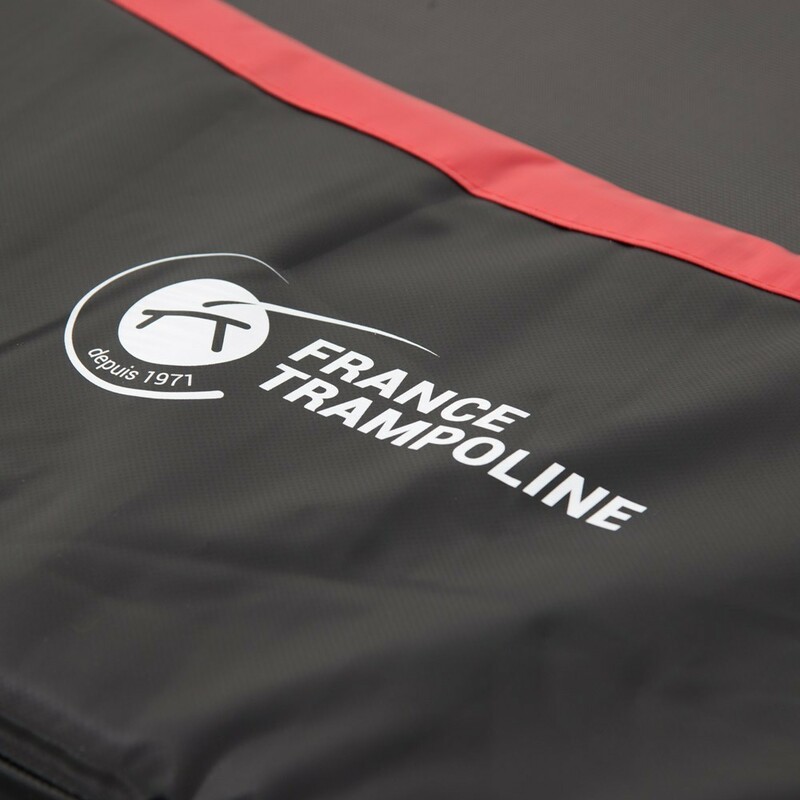 Seamlessly assembled thanks to its T-shaped joining parts, exclusively available at France Trampoline. 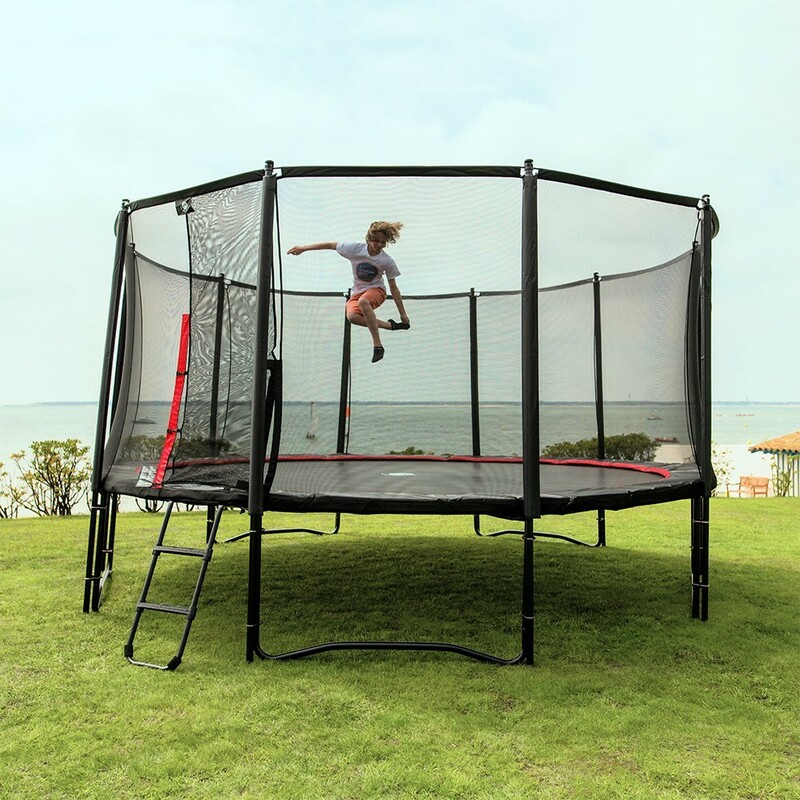 The Booster trampolines are equipped with a Premium quality safety net, and the net's steel frame tubes go all the way to the ground for optimal stability. The net's perfect tension is ensured by fiberglass rods. The opening is secured by a double-closing system. Put more spring in your jumps! Thanks to its extra-large springs, the very tightly-tensioned jumping mat provides athletes with an unparalleled jump height. 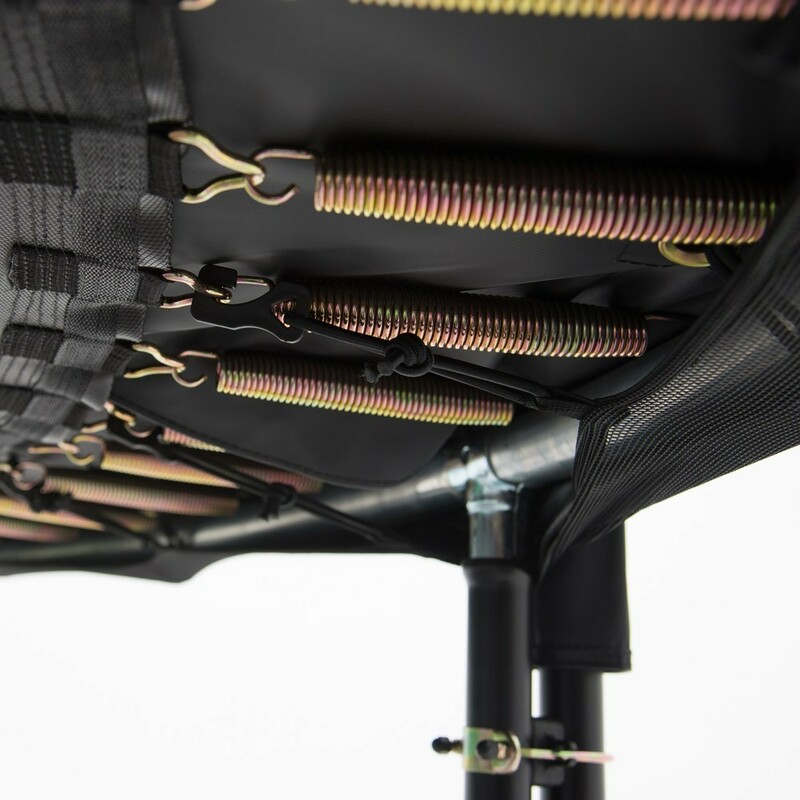 As a guarantee of quality, it is reinforced by 8 rows of stitches, and its fixations keep the springs firmly in place. Bold performances for tireless bouncers! 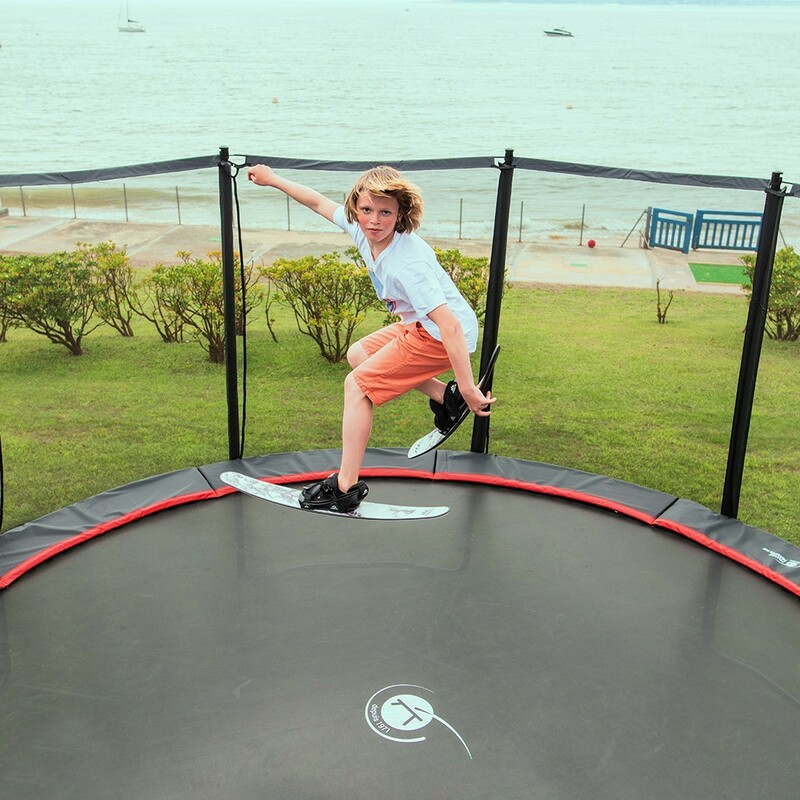 Designed for intensive use, athletic children, teens, and adults will be able to enjoy day-in and day-out the bold performances of the Booster trampolines. 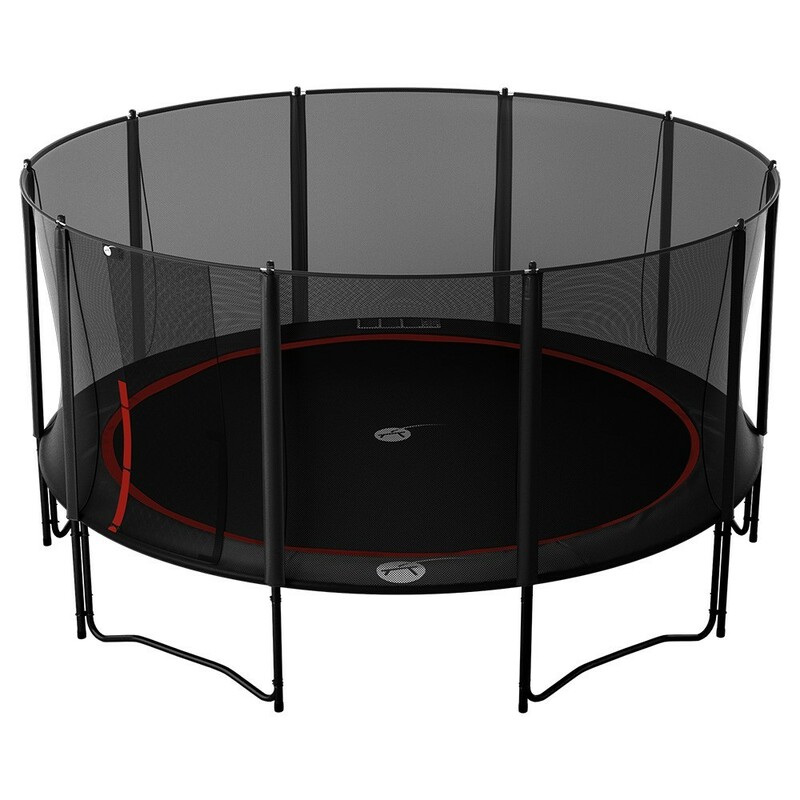 The Booster 490 trampoline with enclosure is perfect for families looking for outstanding performances. 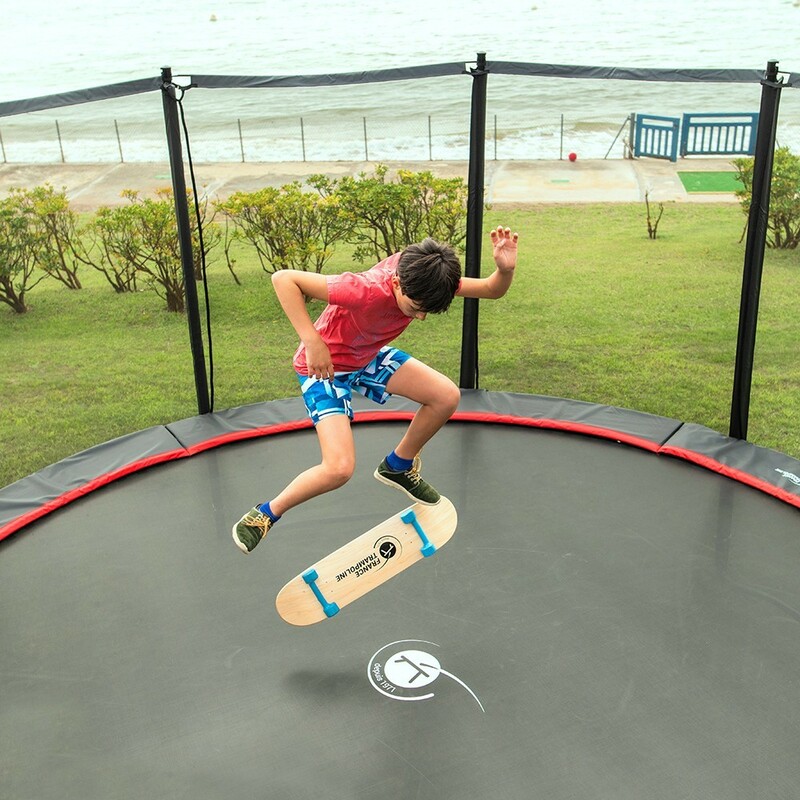 très beau trampoline! beau rebond, grande stabilité; les matériaux le composant semblent de très bonne qualité : rigidité du cadre, précision d'assemblage, qualité des plastiques... super! 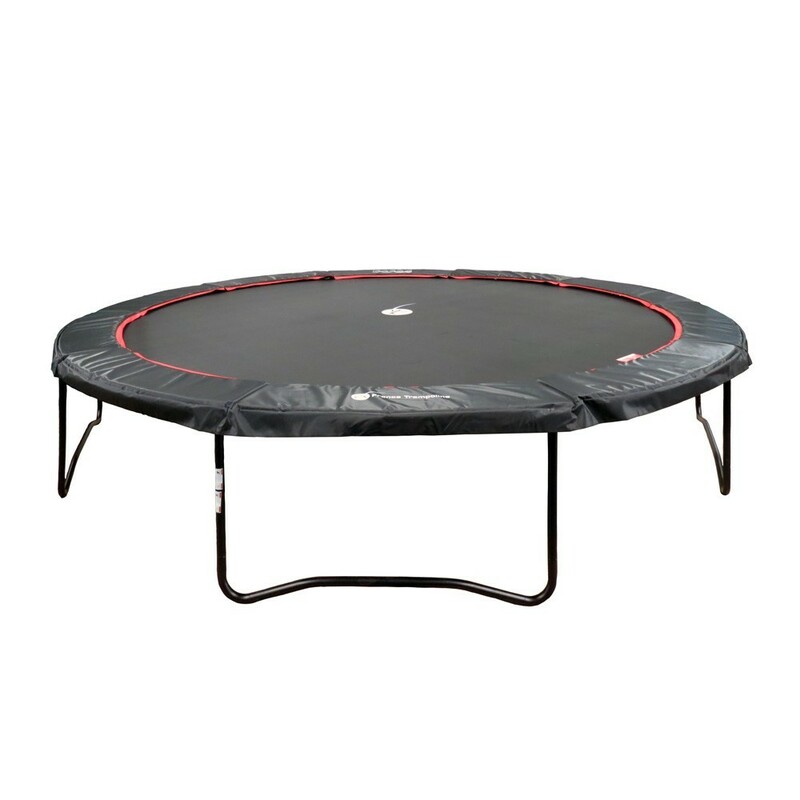 Comme dit précédemment, le trampoline est très bien, le filet aussi. Deux choses sont à revoir : - les crochets qui se cassent rapidement - la porte dont les deux parties se superposent mal.